I'm planning to visit South Korea next month. Short stay, only 5 days. Do I still need a visa? I hold an Indonesian passport with a Malaysian visa (I live here currently). Indonesian citizens do not benefit from visa exemptions, according to the website of the South Korean Ministry of Foreign Affairs. 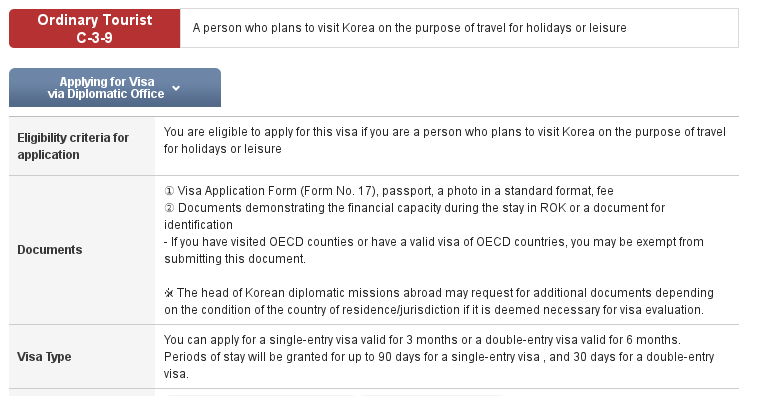 All non-exempt citizens must obtain a visa prior to travelling to South Korea. You can use the online e-form here to begin your application. Visa is not required for a maximum stay of 30 days if traveling as tourist. Not the answer you're looking for? Browse other questions tagged visas customs-and-immigration south-korea indonesian-citizens or ask your own question. Visiting Korea as an Indonesian citizen with a US student visa: Do I need a visa for Korea?